Have you ever had purple hull peas and Chow-Chow? It’s a southern thing. Chow chow is another term for relish and is made different ways. One of my grandmothers made it with ripe tomatoes, and the other grandmother made it with green tomatoes. I learned how to shell purple hulls at a young age. My parents often had a garden, and both of my grandmothers always had one. When it came time for pea-shelling, the whole family helped out. Since I have committed myself to a 21-day detox program of mainly vegetables and fruit, I’ve created recipes that I would have never considered before. Like the one I made yesterday with lentils and salsa. The lentils, intended to be made in a soup, were cooked with vegetables I sauteed. Then I made a salsa. I wasn’t sure what I was going to put the salsa on, but at least it looked good. Colorful. But salsa goes on chips, and this detox plan doesn’t include chips (unless you want the kale kind). The creativity kicked in because I was determined to have that salsa and not by itself. Incidentally, this 21-day program includes shakes. Unfortunately, they aren’t my idea for a shake. They consist of vegetables, fruit, and powder that is supposed to be good for you. Some days the shakes are manageable to drink. Other days, like today, it’s all I can do to finish one. By dinner time I was famished. 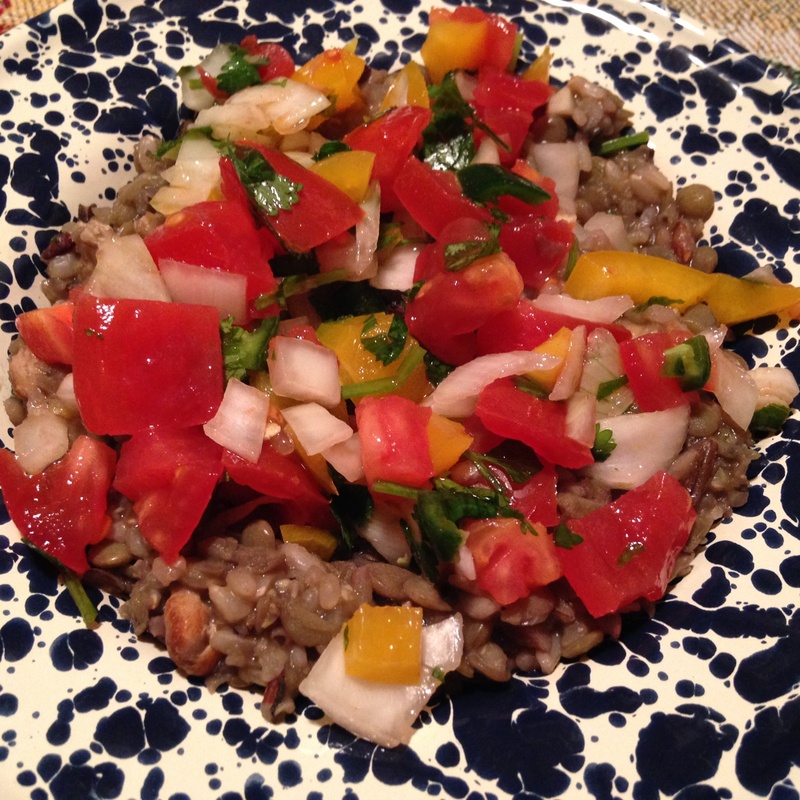 Thankfully, I had leftovers – the lentils salsa, and wild rice. It’s not advisable to eat lentils and wild rice in the same meal, but I did. I mixed a small helping of wild rice into the pot of lentils I heated up. Imagining that I was about to enjoy a bowl of purple hull peas and Chow-Chow, I served myself a bowl of lentils with a huge helping of salsa, my own version of Pico de Gallo. Chop all the vegetables as fine or chunky as you like, toss, and drizzle juice from a lime on top. Pico de Gallo is ready to eat. That Pico de Gallo looks Delicious and easy to make. I love fresh food without all the additives required for packaging. I’ll have to give this one a try. Donna, it is good. I think I’ll try it with more tomatoes next time, though, and maybe less onion. I’ve had it with lentils and wild rice. It would be good maybe with some avocado too. Yes, I’ve tried the celery and carrot dipping. It’s certainly a healthy thing to do. I just get bored with celery and carrots. But maybe I could bake some kale crisps and dip those. Haven’t tried that yet.